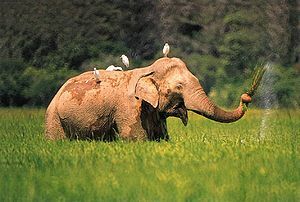 This article is about the Wikipedia article "Elephant", for the article itself, see Elephant. "Elephant" is a Wikipedia article about elephants. Its purpose is to discuss elephants, a type of mammal. The article is among the oldest in wikipedia, with the first archived edit coming on October 10, 2001, when User:Amillar apparently added a thumbnail image (presumably a thumbnail of a version of this image) to an already existing article. The article's history before that date is now lost due to software updates to wikipedia. In this primitive form, the article described the elephant as a "large grayish animal, found in Africa and India." The article has since expanded to provide a more broad-ranging overview on the animal. The article is notable for being the subject of a joke on Stephen Colbert's television program The Colbert Report. 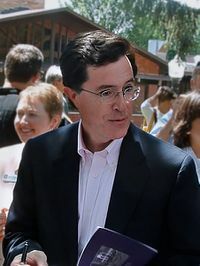 On the August 1, 2006 segment of "The Wørd", Colbert coined the neologism "wikiality", meaning that a large number of people could create a truth by consensus. To test this hypothesis, Colbert advised viewers to edit Wikipedia's "elephant" article to indicate that the population of elephants had tripled in the last six months. Colbert's joke quickly hit online sites such as Slashdot and Fark, increasing the number of users trying to add the Colbert reference to the elephant page. ↑ The oldest archived version of the article. ↑ McNamara, Melissa. "Stephen Colbert Sparks Wiki War." CBS News Blogophile. August 9, 2006. ↑ Gerson, Jen. "Wikipedia handles Colbert: Site withstands prank urging incorrect elephant info". Toronto Star. August 19, 2006. ↑ Ahrens, Frank. "When the truth isn't always factual". Washington Post. August 10, 2006.